Coffee run this morning. 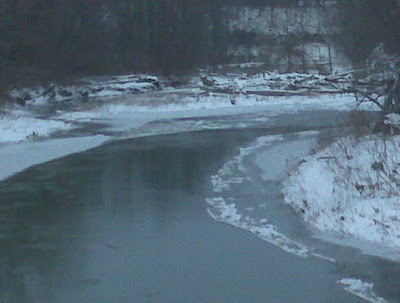 I surveyed the creek to find the lower ice clogged and the pools frozen over. I took a drive to the middle area of the creek and notice there were some fishable and open runs this morning. It is 32 degrees this morning and feel wonderful in comparison to one degree yesterday. the plan is to fish this afternoon in hopes the fish will wake up a little and cooperate. I will be happy with one after my latest crisis of confidence. As I drove up the creek and yes not with a paddle, I notice two cars at the artificial only winter holding pool. I peeked over the cliff to see three fly guys standing on shelf ice and casting. Be care full I thought if that breaks your dropping 3 ft into the water. One of the plates was fr om Texas and no doubt someone home visiting family for the holidays. This brings me to recalling all the out of state plates i have seen this fall on the creek. most of the pressure comes when the Catt is flooding and brown or when the Canadian streams close for the winter. and of course my friends in Ontario and Quebec. It is amazing how the sport has proliferated since the early 90's. As a local it must be frustrating some times to arrive to your favoured spot to see a myriad of liscense plates. I'm often one of those plates but I wonder how I would feel if my special little river had become overrun in such a mannor. Hmmmmmm something to think about.